If your want to know if a product is intuitive it's your first choice to use a standardized method. 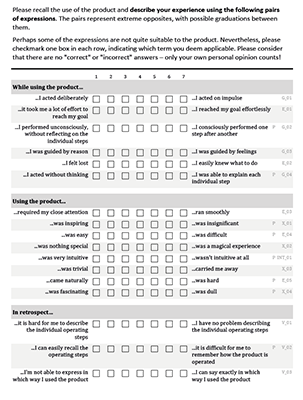 The INTUI Questionnaire is a method to assess the different sub-components of Intuitive Interaction. Its underlying factoral structure was confirmed in numberous studies which results in a reliable measurement. Like our Model of Intuitive Interaction, the INTUI is based on the understanding that intuitiveness is a multi-factoral concept. Therefore, the INTUI assess the sub-components of intuitive interaction with a set of 16 questions. Furthermore it measures a global rating of intuitiveness with an additional question. Each question is designed as a semantic differential: The participant answers each question on a 7-point-scale between two bipolar statements (e.g. "Using the product was inspiring" vs. "...was insignificant"). You can download the INTUI and SPSS-Templates at the bottom of this site. INTUI assesses the four components of intuitive interaction. Download the INTUI Questionnaire and SPSS-Templates (including value conversion macros).